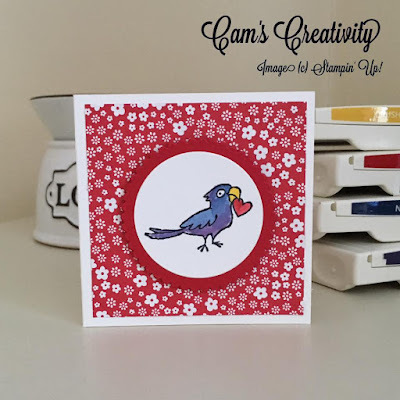 Bella and Friends has been on my wish list since the launch of the current Stampin' Up! Annual catalogue (along with pretty much every other stamp set that hadn't yet made it into my ever growing collection - I'm such a stamp addict), and I'm delighted to share with you the first of my Bella and Friends creations. 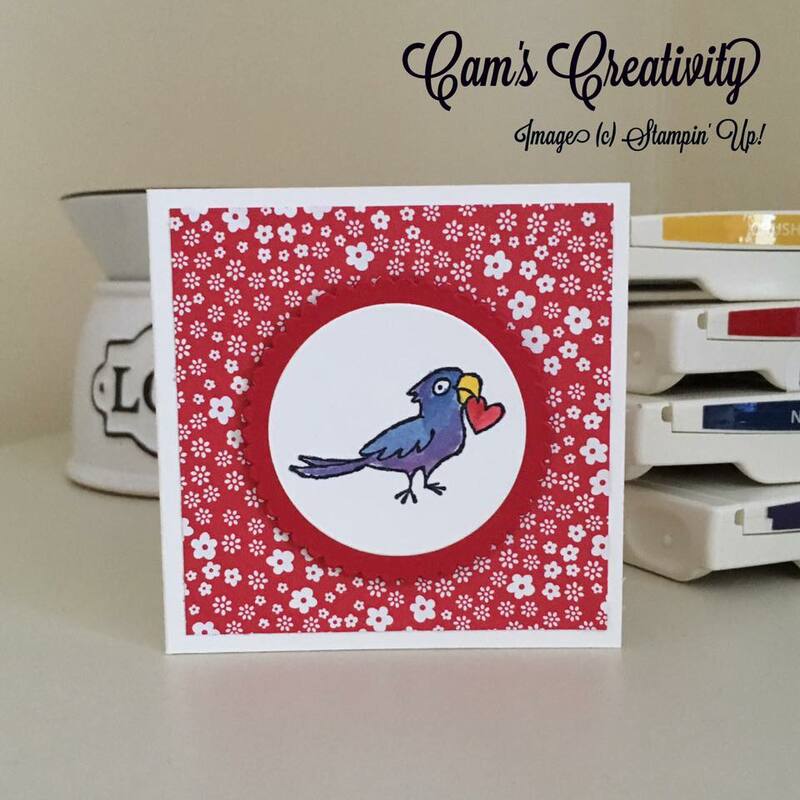 I thought I'd start with a cute little 3" square Thank You card, perfect for popping into a bunch of flowers, or on top of a gift. The card blank (3"x6") was cut from a piece of Whisper White Thick Cardstock and scored down the centre using the Stampin' Trimmer. Then, taking a piece of Whisper White Cardstock and Basic Black Archival Stampin' Pad I stamped the image of the bird (taken from Bella and Friends), and coloured the image using a watercolour technique with an Aqua Painter and Real Red, Night of Navy, Crushed Curry, and Elegant Eggplant Classic Stampin' Pads. This was then cut out using my Big Shot and Layering Circles Framelits Dies, and matted onto a scalloped circle of Real Red Cardstock, also cut from the Layering Circles Framelits. The background was taken from the Brights Designer Series Paper Stack and cut to 2 7/8"x2 7/8" (with an additional piece cut for inside of the card). This was then applied to the card blank using Snail Adhesive, with the topper being applied to the card using Stampin' Dimensionals. The greeting on the inside of the card (also taken from Bella and Friends) was stamped onto a piece of Whisper White Cardstock using Basic Black Archival Stampin' Pad. The greeting was then punched out using the Decorative Label Punch, and stuck in place using Snail Adhesive.